Fantastic Beasts: The Crimes of Grindelwald, 2018. Starring Eddie Redmayne, Katherine Waterston, Alison Sudol, Dan Fogler, Johnny Depp, Jude Law, Ezra Miller, Zoe Kravitz, William Nadylam, Callum Turner, Claudia Kim, Ingvar Sigurdsson, Ólafur Darri Ólafsson, David Sakurai, Brontis Jodorowsky, Kevin Guthrie, Victoria Yeates, Derek Riddell, Poppy Corby-Tuech, and Cornell S. John. As a huge Harry Potter fan, Fantastic Beasts and Where to Find Them left me disappointed in its story and execution. 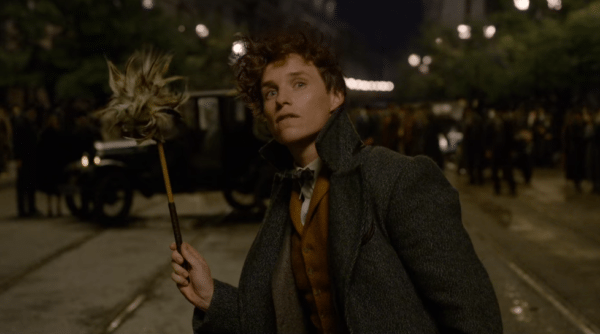 I had hoped Fantastic Beasts: The Crimes of Grindelwald would be a bounce back after a rather mediocre first entry now that the characters and world were established. Unfortunately, the follow-up doesn’t take advantage of its own potential and delivers a dull film with no sense of urgency. The problem with the story is its fairly straightforward and rather boring. There are several periods where nothing really happens to advance the story in a meaningful way. Many of the characters are after the same thing, but there is very little conflict in their searches. 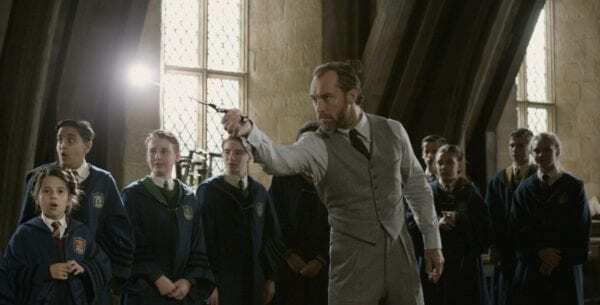 Instead, the conflict lies more in the relationship problems between Newt and Tina, Leta or his brother Theseus, Jacob and Goldie or Dumbledore and Grindelwald. Unfortunately, the film doesn’t explore these conflicts enough to create a significant emotional investment in their resolutions. Part of this is because the main cast doesn’t spend very much time together. It’s a long while before Newt and Tina are in a scene together or even begin talking about their issues. The same goes for Newt and Leta, who share a complicated history with each other that is only barely scratched on. It’s even worse for Claudia Kim’s character as she has a very interesting background and connection to a Harry Potter character, yet she barely has anything to do in the film at all. All the characters of Crimes of Grindelwald are placed in some interesting situations, but the film doesn’t give them room to explore and instead rushes them from point A to B fairly quickly. Choices characters make, particularly towards the end, feel unearned and out-of-the-blue to be truly dramatic. There is a lot to be said of the meandering plot. J.K. Rowling, who wrote the screenplay, is usually so good at connecting the dots and planting various clues for the overarching story, but there is so much going on with not enough payoff. 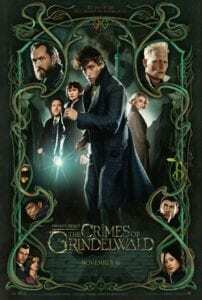 The story concerns itself with mysterious bloodlines, an age-old prophecy and the growing divide of the wizarding world and though each thread comes together by the end of the film, it is in such a tangled mess it’s a bit hard to work out. Speaking specifically of the prophecy, the film glosses over it so much that by the end you may have trouble recalling its importance or what it even is about. The cast does fairly well with Eddie Redmayne, Zoe Kravitz, Jude Law and Johnny Depp being the outstanding performances. Redmayne isn’t quite as charming as he was in the first film, but he seems more comfortable in Newt’s awkward shoes this time around and shares some good chemistry with everyone. Kravitz gives a fairly nuanced performance as Leta Lestrange, showing a complexity that is both light and dark within her character, while Law makes a very good and charming young Dumbledore. Depp was rather a surprise as Grindelwald because, unlike some of his recent performances, he didn’t ham it up and gave the villain a small amount of pathos to his character and manipulations. Katherine Waterson, Dan Fogler and Alison Sudol do well with what they’re given, but aren’t able to take advantage of their stories because of how rushed their arcs are. Even the film’s set pieces aren’t enough to make it more entertaining. Aside from Grindelwald’s escape and a scene with a new and cool beast, nothing screams excitement as there isn’t any real sense of urgency to the proceedings. In one instance, Newt and Tina fully stop their search for an important document, which they must find ASAP, just so Newt can awkwardly tell her she has pretty eyes. The climax isn’t even very exciting as it features very little of the magical spectacle the previous Potter films, Fantastic Beasts included, have gone for. Granted, it does go for something quieter and darker, but doesn’t succeed because the emotional investment just isn’t there. It feels like set-up for the climax of the story even though we’re just two parts into a five-part narrative. Then there is the cinematography that just feels all over the place. The only times the camerawork makes you feel the wonder of the magical world are the prologue and seeing Newt’s home/homemade zoo. The action scenes feel static, but Harry Potter veteran director David Yates employs several extreme close-ups of the actors, and I mean extreme to the point the camera is in their face. With the exception of a couple shots, none of the close-ups feel necessary and instead take you out of the film as well as just being a very plain image. It doesn’t help that the editing is a little off too, with characters being above and at the back of an assembled crowd to suddenly being right in the middle of it or moving to a rooftop discussion when no indication was given someone was on the roof. It adds up for a very disjointed visual flow of the story. Fantastic Beasts: The Crimes of Grindelwald is unfortunately not a good successor to the first film. 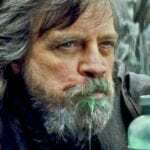 Character arcs are too rushed and not enough happens in the story to make it all worthwhile, especially when most audiences know the broadstrokes ending of this conflict. The cast does well with what they’re given, but they’re ultimately not enough to save the film.